But now we need your help ServiceNation! We need to hear the other side of the story from volunteers like YOU. So we’re calling on volunteers from all over the country to fill out this form and clue us in on how you find volunteer opportunities. This part of the pre-census will provide us with great feedback so when we launch the full-scale ServiceCensus initiative we will be well-informed and able to create a great toolkit of resources for organizations across the country. 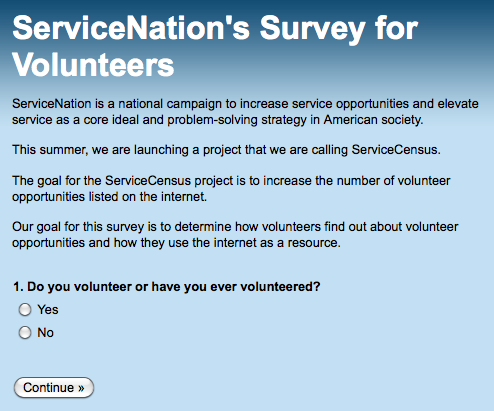 The survey asks questions like have you sought volunteer opportunities online? What barriers existed that kept you from volunteering after reading a posting? And which volunteer posting sites have you used (including my organization’s site, Idealist.org)? And how could volunteer posting sites improve? Have you taken the survey? Or found volunteering opportunities online? What is the value of online volunteer postings, to you? This entry was posted in Opportunities, Service News. Bookmark the permalink. I search for volunteer opportunites through magazines, word of mouth, the internet, my church and sometime my childs school. It’s been many, many years since I’ve found anything of interest, hopefully TheServiceCensus Project will be the break that myself and Thousands of others are looking for to help us meet our volunteerimg goals.